Ocean at the End of the Lane is great and I highly recommend it. I think that almost anyone could appreciate it and enjoy it. And it's a quick read. The story starts as a man recalls a part of his childhood he has forgotten for many years. In the narrative you are transported to a world that is scary and illuminating in a way only a child could talk about. The characters in it very much remind me of the three fates that pop up throughout the Sandman. I always love how Gaiman can weave similar character throughout all of his books. I picked up Status Anxiety randomly at a used book shop downtown. I have great intentions when I sit down to read non-fiction but most of the time I only make it halfway through, but I know I will finish this one. 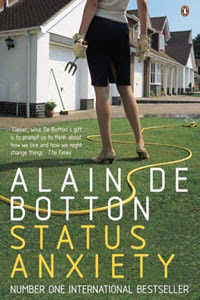 It's really well written and the examples that Alain de Botton gives are very thorough. Essentially the book is about how democracy and meritocracies have led people, whatever "social status" they might have to be in a state of constant state of anxiety about their position. Should I be doing better? Should I have a better job? Should I buy a bigger house? These are only some of the questions he looks at and it's so interesting. I consider all of Dan Brown's books beach reading. They aren't well written, but, what can I say, I love historial fiction thrillers. Inferno was about Dante, but really dealt with ideas of overpopulation which was much more interesting to me. Since reading it, I saw a few articles about the book claiming that (as normal) his data is inaccurate. Nevertheless, I think he had some good points and unlike previous books that mainly tackle religious organizations, this one seems to address a bigger issue.